string(1159) "Resource Centre > Uncategorized > Checkpoints for Companies – Eliminating and Preventing Forced Labour"
This is the complete text of the mobile app Checkpoints for Companies – Eliminating and Preventing Forced Labour, available for download in the Apple Store and in the Google Play Store. 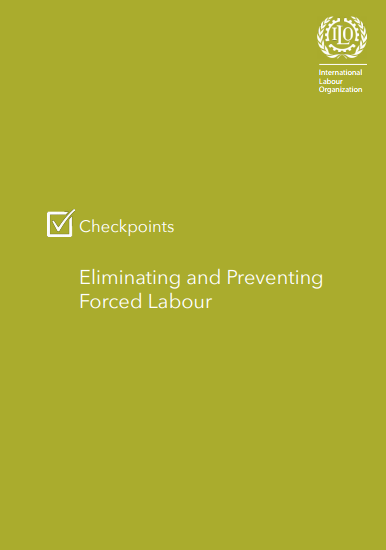 This Checkpoints app allows you to create interactive checklists to help you eliminate and prevent forced labour. There are 38 checkpoints in total, divided into 11 different categories. Each checkpoint provides best practice recommendations for taking action. This document aims to ensure that the content of the app is available to all users, including those who do not own smartphones nor tablets. Checkpoints for Companies – Eliminating and Preventing Forced Labour was created by the International Labour Organization, a specialized agency of the United Nations. Its main aims are to promote rights at work, encourage decent employment opportunities, enhance social protection and strengthen dialogue on work-related issues.